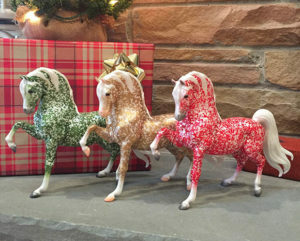 Meet Gold, Frankincense and Myrrh. 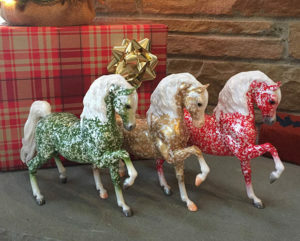 They are Breyer’s Christmas Day Collector’s Club Special Run! 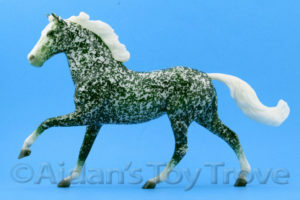 They are a Gambler’s Choice on the Sherman’s Morgan mold in 1 of 3 random colors. They are priced at $95 including FREE SHIPPING. Each color is limited to 350 pieces. Collector’s Club Members should have plenty of time to order as this brings the total run size to 1050. 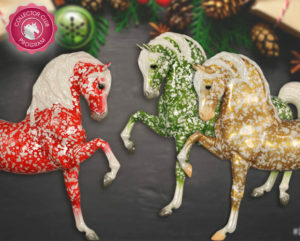 Last year, Breyer offered Holly and Ivy in dappled red and green on the Flash mold. I suspect that Gold, Frankinsence and Myrrh will be a bit less popular because they are on the Sherman Morgan mold. None the less, $95ppd is still a great deal! To you International people, is International shipping free as well? Limited to 350 pieces each. Model chosen at random (you cannot choose which one you will receive). Limit one (1) model per Collector Club member, while supplies last.